This is A. J. Johnson and Ward's fine 1863 map of the world on Mercator's Projection. It depicts the entire world centered on the Americas. Offering a fascinating snapshot of the world during a period of rapid globalization and discovery, this map depicts the entire world centered on the Americas. Africa is largely 'unexplored' and both Lake Victoria and Lake Tanganyika have yet to appear. The Antarctic continent is shown only embryonically, representing the relatively primitive state of Antarctic exploration in 1863. The routes taken by various important explorers, including Cook, Wilkes (U.S. exploring expedition) and others are noted. The map also identifies important shipping and nautical routes between America and Europe as well as the path of the Atlantic Telegraph Cable. 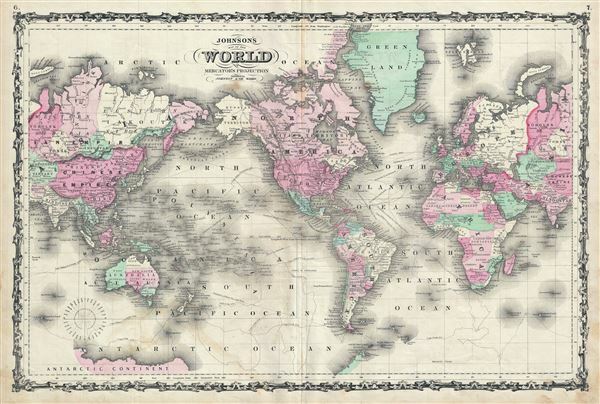 Features the strapwork border common to Johnson's atlas maps from 1860 to 1863. Published by A. J. Johnson and Ward as plate nos. 6-7 in the scarce 1863 edition of Johnson's Family Atlas. This is the second edition of Johnson's atlas to bear the 'Johnson and Ward' imprint. Very good. Minor wear along original centerfold. Minor spotting at places. Blank on verso. Rumsey 2905.038 (1860 edition). Phillips (Atlases) 6140-56-57.